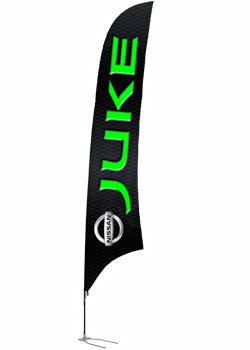 These 17' feather banners are great promotional tools that can draw customers toward your business. Assembly for these goods is easy. There Are Thousands Of Feather Banners That Can Be Found Here. 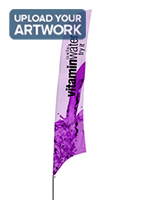 Feather banners provide users with a unique way to advertise for an event, product or business. 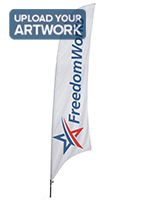 Use these advertising flags to capture the attention of potential customer passing by your establishment. These feather banners, also known as bowhead banners, are the perfect solution to your outdoor display needs. 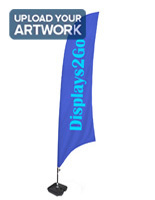 These blade flags will add instant value to your advertising campaign. 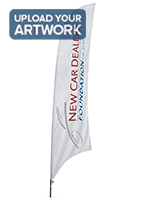 With a sturdy construction and large custom graphics, these feather banners are perfect for parking lots, golf courses, beach events and outdoor concerts. 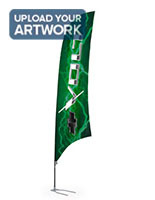 Although perfect for outdoor use, blade flags are also ideal indoors as well. 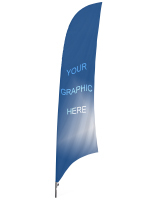 We sell these feather banners with a 19' pole that curves to follow the shape of your graphics. The car foot base included with this unit is ideal for advertisers that frequently set up booths at different locations frequently. Feather banners are lightweight, portable and user-friendly displays. 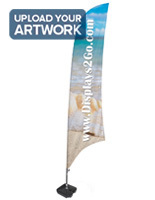 These outdoor advertising flags are offered in two different types of printing. We sell these feather banners with full color graphics that are digitally printed with your artwork. Digital printing is especially offered for quantities smaller than 10 because it does not require a minimum order quantity like silk-screening. A digitally printed feather banner is also a better choice for complex designs, photographic images, and art with gradients. The downside is that digital printing does not offer as high a color penetration as silk-screening. This means that images are visible on the back, but are not as vibrant as the front. Each banner is printed on one side only. Replacement graphics are also available. These feather banners are NOT designed to be used in winds exceeding 20 mph. Doing so may cause damage to the unit. Customers using the metal cross base please note: This base is not designed specifically for outdoor use by itself. If used outdoors, we recommend using the included water bag.